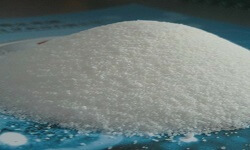 Glycerol monostearate is a glycerol ester of stearic acid and is commercially used as an emulsifier. It is a sweet tasting flaking powder and it is hygroscopic in nature. It is a naturally occurring acid which is present in human body as a by-product of breakdown of fatty molecules. Glycerol monostearate can be obtained from the glycerol compound by different methods such as glycerolysis, hydrolysis of triglycerides and the direct esterification of glycerol with fatty acids. Catalyst involved for the production of glycerol monostearate are either homogeneous solid acid catalyst (Zeolites) or solid basic catalyst (Zinc oxide) at higher temperature conditions. It is also used in laundry and dishwashing products as an antifoam raw material, as lubricants and lubricant additives and as surface active agents. Glycerol monostearate is used mainly as a food additive, thickening, emulsifying, anti-caking and preservative agent in the food industry. It is responsible for giving ice cream its smooth texture. It is sometimes used as an anti-staling agent in bread. Glycerol monostearate is used in cosmetics industry for the production of hair care products, balsam, cold cream and hair oil products. In pharmaceutical industry, glycerol monostearate is used as a solidifier and controller release agent.